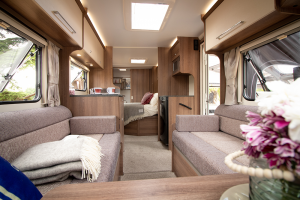 The new Bailey Phoenix replaces the very popular entry level Bailey Pursuit range, but don’t be fooled, there is not a lot in this brand-new caravan that would say “Entry level” In fact the marketing team have re-invented the phrase “entry level” and coined the phrase “First Choice’. 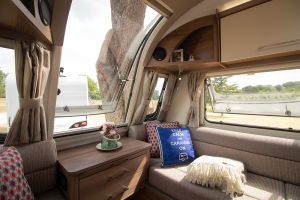 The look and feel is more in line with the Series 4 Unicorn, and as you look around the caravan you might see details that are borrowed from the Unicorn range. The exterior boasts a fresh clean look with high contrasting graphics on the polar white shell and the clean bright white finish is contrasted with the black A frame and dark trim around the windows. Like the other caravans in Baileys portfolio, the gas locker is held mid way down the caravan to assist with weight distribution. Services including the toilet can be found down the offside of the caravan, all except the electric hook up which situated on the other side in all the layouts. The back of the caravan has a clean look roofline, with no complex moulding, which is both elegant and practical at the same time, allowing water run off when in storage to minimise those pesky black streaks. 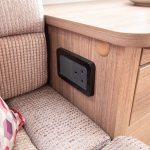 There are some giveaway signs that this is a “First Choice” caravan, and that is clear when we see there is no BBQ point, and no ALKO secure – Although the demo units did have the ALKO receivers installed on them, I’m assured the production models will not have this feature. Once great design aspect is the inclusion of a stable style door, this is a feature that has been missed on so many caravans recently, I am certainly glad to see its return. There are 7 layouts in this new range, from the impossibly cute 2 berth 420, all the way up to a practical 6 berth 760. There are 4 different 4 berth layouts and a 5-berth end washroom layout that completes the line-up. All the caravans use the same “Brockwell” fabric option and general colour scheme of Eucalyptus wood and brushed Champaign cupboard doors. Whilst discussing the cupboards and lockers – there is immense storage space in all the layouts from the large overhead lockers, and the cupboard that welcomes you as you initially walk in the caravan. It’s a welcome sight to see that storage space is not forgotten about in this new range. The central large window provides lots of light into the living space. There are 2 open cupboards at the front of the caravan, on the left this space contains the radio and on the right, it is open for any personal affects. Beneath these are 2 reading lights and 1 light even contains a USB charging point. The front chest contains 2 draws, a pull out table and on the side is a 230v mains socket. A perfect and well thought out place for a table lamp, or charger for the ever-growing list of gadgets. Depending on the layout depends on the size of the front seating area, but the seats can all be used as 2 single beds and, can be made up to a large double bed with ease. Just like the Unicorn the Phoenix kitchen incorporates a cover over the cooker. With this cover, it negates the need for a pull-out flap as there is plenty of preparation space. The sink has a removable draining board, allowing maximum work top space and flexibility. The only issue here is the cooker is tight against the bulkhead – so handles for pans will need to cross the hob. The cooker is a 4-gas burner Thetford Caprice, with separate Grill & oven which sits next to a huge drawer, big enough for lots of cutlery and utensils. The control panel for the Truma heating and hot water is just behind the sink, along with 2 x 230v outlets perfect for a toaster and kettle. Above the kitchen are large overhead lockers with positive latches while on the other side is the triple fuel refrigerator. The 6 berth 760 has a tall fridge freezer, while the rest of the range contain a short combination Dometic fridge freezer. In this instance, the top of the fridge has a handy work space, where there is a TV antenna outlet, a 12v socket and a single mains outlet too. Above this work space is the 800w microwave, situated at a good height, although shorter people may struggle to use this safely. Towards the back of the caravan is the sleeping area and this where the various line ups differ from each other. I had the opportunity to visit Bailey and film 4 of the 7 layouts, below are the 4 layouts I reviewed, if you require further information and details about the layouts head of to the Bailey Website for more information. 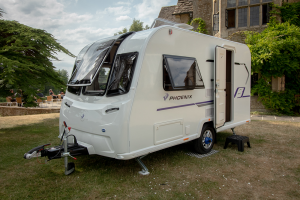 Prices for the Phoenix range from £16,699 for the 2-berth 420, £18,499 for the 4 berth and 5 berth models and £19,999 for the 760 6-berth layout. 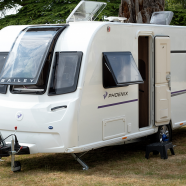 It places the Bailey Phoenix at the entry level range, but the value for money, added features look and feel make this caravan far from entry level. Perhaps the marketing types have got it right? Perhaps this should be your first choice for a new caravan. Thanks for a really useful review. This new Bailey seems to have all the same must have ability as a 2003 Elddis Avante did when we bought one of those new. Great post. It is very informative post for everyone I love reading this information. This is a perfect blog . Keep posting and keep sharing like this. Excellent post. It is very informative information about caravan insurance. It is very useful for everyone. I love reading this information. Thanks for sharing this information.